Believe it or not, George Baird wasn’t the only Hawkeye to win a medal in the 4×400 meter relay. 68 years (and 17 Olympics) after Baird captured gold in the 4×400 meter relay, Anthuan Maybank lined up to run in that exact same event. Anthuan Maybank attended Georgetown High School in Georgetown, South Carolina. He didn’t even start running track until his sophomore year in high school, but by his junior season, he was one of the fastest high school runners in the country. Maybank finished with the nation’s second-best prep time in the 400 meters during his final year at Georgetown. He visited Tennessee, Baylor, and UCLA in addition to Iowa, and he admitted that he probably had a little more fun on those visits. But former Hawkeye track coach Ted Wheeler won over Maybank, and more importantly, Wheeler earned the approval of Maybank’s mother and church pastor. Maybank excelled at track at Iowa, breaking school records in the 200-meters (indoors), 400-meters (outdoors), and long jump (both). He won both the 400-meter race and the long jump at the 1993 Big Ten championships, and he was named the outstanding athlete of the meet. Anthuan Maybank’s biggest moment at Iowa, however, came at the 1993 Drake Relays. He won the long jump by leaping over 27 feet, which shattered the previous record set by New Mexico’s Clarence Robinson in 1965. Robinson’s mark had been the oldest existing record in Drake Relays history at the time. The next day, Maybank went on to win the 400-meter race at the Relays in 44.99 seconds. This made him the first man to ever break both the 27-foot barrier in the long jump and the 45-second barrier in the 400-meter dash. And he did it all in the span of two days. By 1996, Anthuan Maybank was ranked number two in the world in the 400-meter dash behind Michael Johnson. 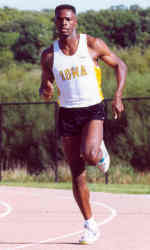 However, he only placed fifth in the 400-meters at the 1996 U.S. Olympic Trials. Maybank failed to qualify as an individual, but the Olympic team coaches selected Maybank as an alternate for the 4×400 relay team. To medal, a 4×400 relay team had to go through three rounds. The best nations after an opening heat advanced to a semifinal round, and the top countries there qualified for the Olympic finals. Many top countries kept their best runners fresh by using alternates like Maybank for the qualifying rounds. Maybank anchored the U.S. 4×400 relay team in the first round, and he figured that this might be the extent of his Olympic experience. You can watch the footage of the first round here. But when Michael Johnson and Butch Reynolds sustained injuries during the Olympics, it became apparent that Maybank would be leaned upon more heavily than planned. The United States advanced to the finals of the 4×400-meter relay, and Maybank was tabbed to anchor the squad. Because of the injuries to Johnson and Reynolds, many spectators felt the now-inexperienced United States squad would be strongly challenged; Britain and Jamaica, in particular, were seen as two of the favorites at the event. Since retiring from competitive racing, Anthuan Maybank has worked as a sports commentator in Europe and is currently a marketing analyst for Barclays. He now lives in Delaware but is constantly looking for opportunities to return to Iowa. “Every time I go back and run into friends, I realize I want to be there permanently because it feels like family there,” Maybank has said. Hopefully Maybank – who is the most recent Hawkeye to claim an Olympic gold medal – finds a way to make it back to the state he made proud.